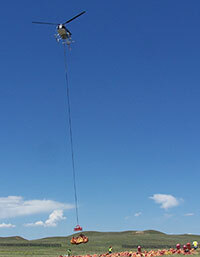 Trans Aero LTD has a long history of performing oil and gas seismic exploration support in a variety of environments. Our highly trained pilots, coupled with the very best equipment, allow seismic crews to maintain an aggressive rate of productivity. With industry-leading maintenance personnel and a management team designed around a rapid response culture, Trans Aero LTD is able to provide excellent aircraft availability. Our crews understand that time is money, and we can adapt quickly to each specific mission, thus allowing us to perform to our customers' complete satisfaction in any environment. 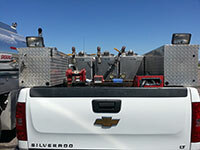 Our crews come equipped with four wheel drive fuel support vehicles, ensuring our ability to service our aircraft in any terrain your job may take us. 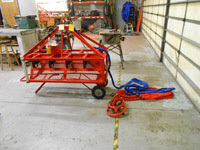 Also on site is a fully functional maintenance trailer with everything from generators and air compressors, to spare long lines and carousels, designed to guarantee our ability to keep you working. With safety being our number one priority Trans Aero LTD employs a fully integrated SMS program designed to be an interactive tool for our crews to address any issues. Trans Aero LTD uses an eight hook carousel for spotting bags of equipment at specific coordinates provided by the client. 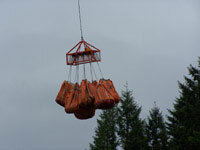 This equipment allows us to drop eight bags independently at eight different locations. We use synthetic long lines which greatly reduce the weight of the load. 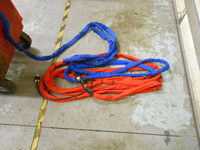 These lines are built at Trans Aero LTD from 12 strand plasma rope and encased in a durable nylon sheath to protect the line from snags and the environment. These lines are pull tested following manufacture to pre stretch and ensure that they meet the load requirements for the mission parameters. 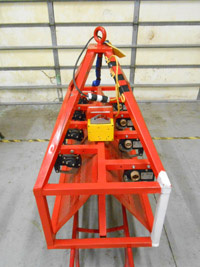 We also use single point remote hooks for specific single load applications that allow an electrical release of the load from the flight deck. Our carousels, shackles, remote hooks, long lines and “D” rings are all tested annually to ensure that they meet the minimum load requirements set by the manufacturers’. 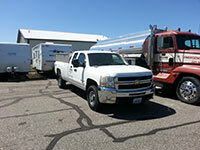 This testing is performed at our ground support facility by highly qualified technicians. Each piece of equipment is then certified by serial number and documented and archived until the next inspection interval. 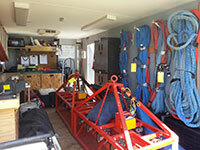 Copies of these certifications accompany every equipment item when deployed. In addition to annual load inspections, each item is subjected to documented daily and weekly visual inspections to ensure no damage will compromise the safety of its use.